Sign and Art has extensive experience all modern sign manufacturing processes and techniques and can provide expert advice in choosing the right materials to produce a practical solution with a striking finish. We employ quality materials and use state of the art manufacturing facilities for each project. The demands of modern signage are met with an extensive range of hard wearing and durable materials to ensure a long-lasting and weather-proof yet attractive and striking signage. Sign and Art has over 25 years experience working with the full compliment of sign making materials including acrylic, aluminium, glass, brass, stainless steel, PVC, wood, foamex, dibond, PVC banners, vinyl graphics and digitally printed vinyl. 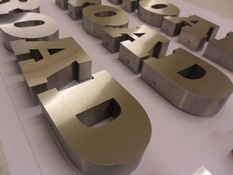 Our manufacturing capability works closely with our design team and specialist key suppliers to ensure your sign is produced and finished exactly as it was presented to you in rendered form at the design stage. Throughout the process of manufacture, Sign and Art remains in close consultation with the client to arrange for the next stage, delivery and installation.